LENEXA — They didn’t have much to begin with. And then they lost even that. “Most of them now don’t have homes to go home to or are living in cars or shelters,” said Hallie Richter, a teacher at the Holy Trinity Early Education Center in Lenexa. Richter and fellow teacher Kelley Thrasher teamed up with an elementary school in the Houston school district to relieve the suffering of its young students after Hurricane Harvey. And it started with a social media challenge. “My mom tagged me in this Facebook post that was [about] adopting a classroom, and it was from a blogger,” said Richter. “She matched the teachers who emailed her that needed help with people who wanted to help,” she said. Richter felt moved to help, so she and Thrasher were soon paired with an elementary school in the Houston public school district suffering from the ramifications of Hurricane Harvey. “All of their students are either at or below the poverty line, so they didn’t have a lot to begin with,” said Richter. “A lot of them she said are on the free meal plan, and they’re only eating when they come to school,” she added. After Harvey hit, their living conditions quickly worsened. Richter and Thrasher were eager to help. “First, I just asked my family for help,” said Richter. Then they asked the Holy Trinity School community, sending out an email to let parents know they were collecting items. “The whole school has been bringing stuff in, so we’ve had help from everybody,” said Richter. The two teachers share a classroom, and switch off as lead teachers for the morning and afternoon sessions. They have spoken to their students daily about the importance of the items they’re donating. Although the students are young, they understand what this project means, said Thrasher. “You can read it on their faces,” she said. “They’re always so excited to help with things and to have a job to do, and to make Jesus proud,” said Richter. And the recipients of their efforts are very much in need. “[The Houston teacher] was having to buy some of the snacks out of her own pocket,” said Thrasher. She was also unable to decorate her classroom this year. “One of the joys you have is getting your classroom ready at the beginning of the year,” said Richter. 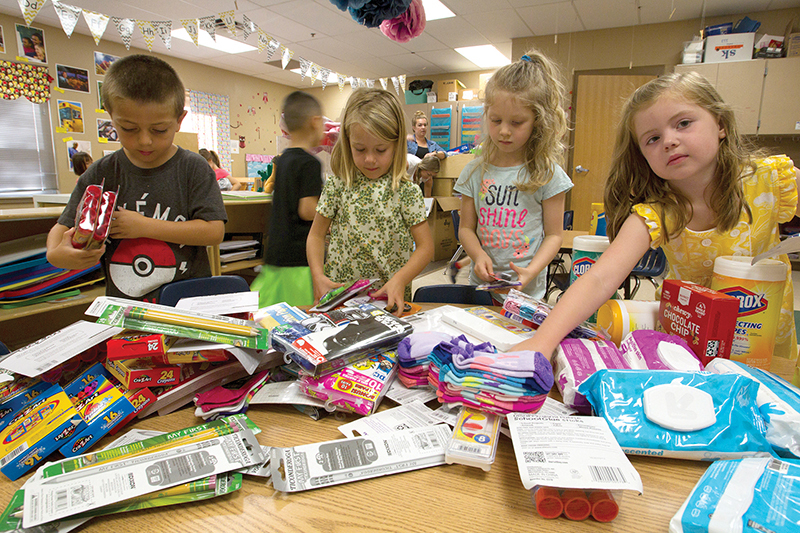 Having a personal connection with the school receiving their donations has made the act of giving even more special, said Thrasher. “It’s definitely different,” she said. “I think that’s helped the children to understand that there’s other children that are needing these things,” added Richter. “There are people who don’t have what they have — who don’t have homes, fresh clothes, food at their house,” she said. Although Houston seems far away to the students, Richter hopes this experience helps them develop a deeper sense of empathy for those going through tough times.